Peaches are a widely popular delicious, juicy fruit having with soft skin and sweet flesh. They are the member of the stone fruit family. Peach are characteristically a fuzzy fruit native to northwest China. First cultivated in China, they are now available across the globe. They are the rich source of vitamins, minerals, antioxidants and other chemical compounds and have amazing health benefits for the eye, heart, skin, kidney and so on. here we will see some of the amazing health benefits of peaches. They are rich in vitamins including A, C, E and K. Vitamins are useful for the body providing proper nutritional content. They are also a good source of antioxidant and fiber. Antioxidant, Chlorogenic acid, works as anti-inflammatory in the body. On the other side, fiber is good for digestion. It also prevents constipation. Peach fruits are the good source of potassium, which acts as an electrolyte that is good for the heart. It enhance the blood pressure and lowers the risk of cardiovascular diseases. Beta-carotene is a vital element present in it which is responsible for eye strength. It improves your vision by increasing blood circulation throughout the body. The beta-carotene also nourishes and protects the retinas in your eyes from free radical damage, as well as helping to prevent cataracts and age-related macular degeneration. They are great sources of vitamin C and contain only 68 calories. The high amount of sugar in peaches is natural and therefore, does not have an adverse effect on fitness. It can be used in salads, oatmeal food, and yogurt to enhance the taste. Peach fruit help to prevent symptoms of redness, swelling and joint discomfort since they contain extremely high levels of anti-inflammatory components. Peaches are the great source of vitamins A and C, which are highly essential for skin complexion. Vitamin A provides moisture to the skin, which improves the skin’s texture making it soft and supple. Vitamin C is a powerful antioxidant that protects the skin from free radical damage. Rubbing it directly on your skin helps to get rid of dark circles and wrinkles. Eating it on a regular basis may help to control high cholesterol and problems that lead to diabetes and heart disease. This is mainly because they contain phenolic compounds that prevent the oxidization of low-density lipoprotein, or LDL, cholesterol. Being filled with the antioxidants, like chlorogenic and neo chlorogenic that are found in it, can slow down the growth of breast cancer cells and help prevent cancerous cell growth. Peach can effectively decrease heart disease by getting rid off the free radicals that can lead to heart attacks and strokes. It also helps regulate a normal heart rate and keep blood pressure in check. Peach can help to treat joint disorders, such as rheumatism and gout, due to the high levels of vitamin A. The antioxidants in peaches benefit your heart by destroying free radicals that start chain reactions within your body and can damage or kill cells. They also contain bio-active compounds that help fight metabolic syndrome, a combination of risk factors that causes inflammation, obesity and heart problems. It also has other nutrients which promote cardiovascular health by reducing cholesterol levels and increasing blood flow to the heart. Peach fruit provides excellent diuretic and laxative properties; therefore, this natural product can be used to tone and stimulate the function of kidneys and bladder. It can also assist in dissolving kidney and bladder stones. It contains the high amount of fiber and potassium that reduces kidney related diseases and lessens the risk of ulcer. It is one of the best-hidden health benefits of peaches. 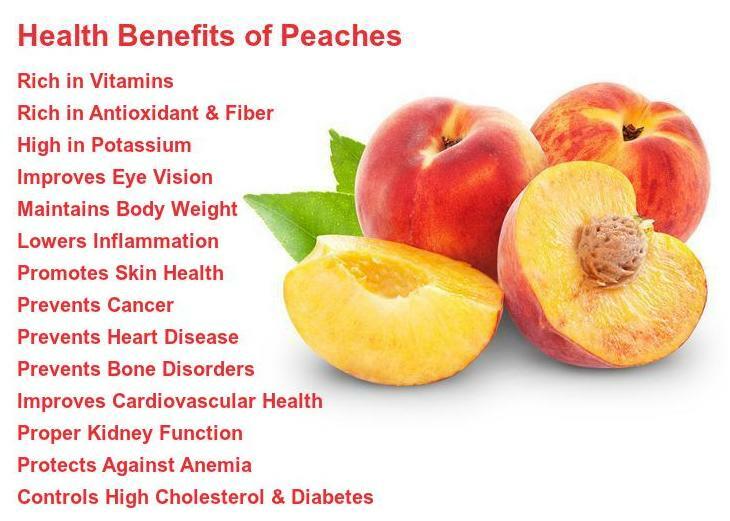 Health Benefits of Peaches to protect our body in Anemia. It helps increase the production of hemoglobin in the bloodstream, which combats fatigue and drowsiness symptoms. Those two symptoms are most commonly attributed to the disease.